My love for slot cars began in the early seventies when I received my first slotcar set for Christmas. Remember the old Christmas toy catalogues back then? Well, I used to drool over all those slotcar sets every year. I kept hearing, "someday Jim you may get one but right now you are still a bit too young." To my surprise at nine years old that wonderful Christmas back in 1970 or so, I got one. It was a set similar to the AFX set pictured here. I was in heaven! I played with that set all though the day and for weeks following. Then, I starrted buying more cars, more track. The sickness overcame me and I was totally engulfed with the hobby. I would take out my stopwatch and time the cars trying to surpass the fastest times for hours on end. I had filled my notes with countless laptimes and other such numerology. I told all my buddies about what I was doing and how I was keeping track of each cars' records. They were ensared by the details. That following summer 5 or 6 of us put all our track together and created one heck of a layout. It must have been at least 150 feet long. We had several long straights and multiple levels. We spent the whole summer in my basement. We had a blast. It had to one of the best summers of my life. A fews years of that and then high school started and we were too big to play with toys cars. We were cool. Anyways, being a jock started taking control of my life and the track and cars were all packed away in the corner of the attic. Went to college and got married and all of a sudden 10 or so years passed without me even thinking about slotcars. Back in the mid eighties a new family moves in on the block and the husband and I hit it off. One day on the golf course the subject of slot cars came up. Well we had more fun talking about slotcars than we did playing golf. On the way home we stopped off at the local Toys R Us and picked up a Tyco HO set and a few extra cars. We set it up that same night and played all through the night and wee hours of the morning. Needless to say I was hooked once again. I couldn't get over how much improved the cars were. I had to get every one. We spent the next few years racing once a week until my wife and I moved. That was the end of my slotcar days once again until a few years back. Back in late 2001 I came across that old Tyco set and set it up on the floor in our living room. To my surprise it still worked. My kids and I were playing with it all that day and they were just having the greatest time. I was too. Then it hit me, this would be a great thing to do with the kids. That night I went on Ebay to see if there were any slotcar stuff for sale. I was shocked to see all the old slot car stuff. 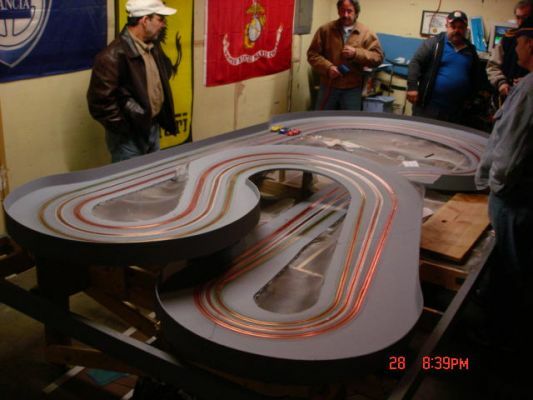 I sold off my prized chess sets to get some unbudgeted money to build a really cool four lane track for the kids an I. We had excellent family time with the layout and I was again hooked. This time with ebay there was no stopping me. I would be able to get slotcars I had as a kid. Then one day I saw a FLY slotcar for sale on ebay. I wasn't familiar yet with the 1/32nd scale stuff yet so I said myself, I just might buy one of those. Well, I did and when it came I was in awe of the detail and the quality of the workmanship. I told my wife I just might have to get a set and see what this 1/32nd stuff is all about. I started doing some research and was I wowed. Slotcars are still popular and not just here in the U.S. but in Europe it is huge. My curiosity got the best of me so I bought a new Scalextric set. Set it up and was hooked even more. My first 32nd scale car. One day in 2002 I was looking at the Fantasy World website and noticed there was a forum. I went on there and asked if there were any clubs in the Chicagoland area looking for any racers. One of the guys from the WSSCA club responded and invited me to join them. I said sure and went to my first race which was at Walnut Grove race track. I was told it was a wood track and I said interesting, I have never even heard about such a thing. I walked in not knowing what to expect and wow! I fell in love all over again. I was thoroughly impressed by this wooden track and the racing set-up these guys had. That hook went even deeper. I went to a few more races and was enjoying the group and I became a member. Bought a few more cars, and then sold all my HO stuff so I could have my own raceable set-up. 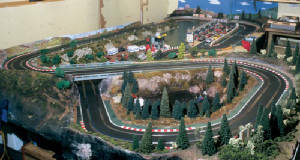 I then built "Tabasco Lakes" out of Scaley Sport track and had fun on it with the club for about a year and then decided it was time to go to a wood track. It took me a while to come up with a layout that I liked. The designing was fun and I had such a great time doing that. But enough was enough I had to get started with this track. In the Spring of 2005 Talladago was finally built with the help of several club members. Had it not been for them I would not have been able to accomplish the task. Then the hard part came. What was I going to name the track. I kicked several names around but they were not grabbing me. Then it finally came to me. I have always like Talladega on the NASCAR circuit, and being Italian I came up with the play on words Talladago Speedway. And that, my slotcar friends that is the history of Talladago.